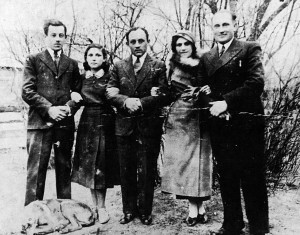 The couple on the right are Claire’s parents. Thousands of Jewish families survived the war in hiding. Sometimes helped by people who put their own lives at risk. At times hiding in the forest, Claire Boren is one of those survivors. She was born in Poland in the town of Mizocz which had a mostly Jewish population of about 2000. She lived with her parents and an aunt, uncle and cousins. Her grandmother and other relatives also lived on the same property. Sometime in 1941 or 42 all the Jews were rounded up and confined in a ghetto in their village. Her most vivid memory at that time was witnessing a public hanging in the town square of Jewish men. Her father, realizing the growing danger, paid for the whole family to go into hiding with a Christian family. Fortunately, the peasant man warned them that they had to go into hiding immediately that day. That was the last time Claire ever saw her father. Claire and her mother left, but her father stayed behind. The very next day, on Oct. 13, 1942, the ghetto of Mizocz was liquidated. The Jews were either shot or deported to concentration camps. The town of Mizocz, which had existed for 500 years was destroyed in two days. Unfortunately, after several weeks, the peasant fearing for his own safety, told Claire and her mother they had to leave. After leaving their safe hiding place, while walking on a road Claire’s mother saw two farms, one more prosperous than the other and chose the poorer looking farm to ask for shelter. This family of poor religious Christians agreed to hide the two strangers. They dug a hole on their farm under a pig sty about the size a coffin, just large enough to hold the mother and child. They stayed there day and night, day after day, holding on to each other and waiting for food to be lowered to them at night. Of course, it was pitch black all the time. At first her mother kept Claire occupied by telling her stories from books and memories. In this black hole, Claire couldn’t tell day from night. When she slept her mother was awake and when her mother was sleeping she was awake. She retreated into an imaginary world and lost all touch with reality. In this disoriented condition, the peasant told her mother that Claire must be possessed by the devil and should be killed. Her mother realized they had to leave that hole and the constant darkness if Claire was to survive. Desperately, she took Claire to another village where she knew someone and Claire was able to play with other children which allowed her to recover. 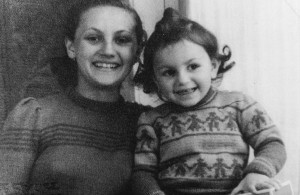 Since Claire spoke fluent Polish and did not look Jewish, she could be out in the open, while her mother had to stay hidden. Some time later, they learned that there was a group of Jews hiding in the forest nearby. They joined this group which included her uncle and two cousins. They stayed in the forest for several months without any shelter, living on berries and mushrooms. The local Ukrainian and Polish population would come into the woods to find and expose Jews to the Germans. Before long, the whole group was killed, except for Claire and her mother. Claire and her Sister Bina. At this point, her mother decided to return to their house in Mizocz to try and find some money and jewelry that had been hidden in the back yard and which she planned to use to pay someone to hide them. She left Claire in a shed near their old home while she dig up the money. While this was happening the Allies were shelling and bombing the area and Claire, hidden in a dark shed alone, was terrified that her mother wouldn’t return. Imagine, at the age of five she was trying to make a plan of what she would do if her mother didn’t come back. When her mother did return with some money, a silver cigarette case and her grandmothers earrings they were able to find someone to hide them until the Russians liberated the area. This was in the Spring of 1944. Finally, rescued, they were able to a get to a nearby town where all the survivors were gathering. Being Polish citizens they were allowed to leave the area to return to Poland. Next they went to Germany to stay with other refugees in a Displaced Person camp. While living in the DP camp, Claire’s mother remarried and her sister Bina was born. The family stayed there about 3 years, waiting to emigrate to United States when her mother found a cousin living here. Sitting from left Claire and her Mother Anne. 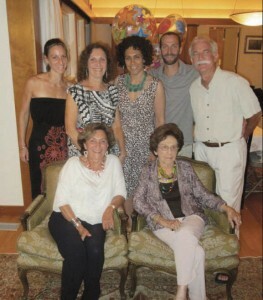 Standing from left to right Niece Danyel, Sister Bina, Daughter Sari, Nephew Ari and Brother-in-Law Ira. As an accomplished and recognized visual artist, she believes that her art reflects her past experiences and memories that will stay with her forever. They are plainly in view on the walls in museums and in her beautiful home which she shared with her remarkable late husband Adam, who survived Auschwitz and went on to become a successful entrepreneur in America. Together they built a life of close family, community and philanthropy.